The internal components of SciBath, a neutron and neutrino detector, include liquid scintillator and wavelength-shifting fibers. Photo courtesy of Rex Tayloe, Indiana. The latest underground dweller in the MINOS tunnel is SciBath, a neutron and neutrino detector designed and built by an Indiana University team. 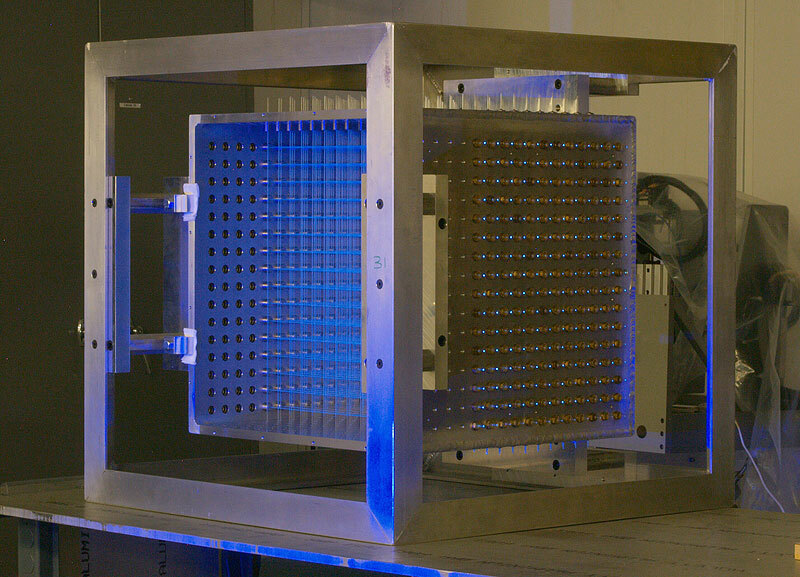 Scientists are using the detector cube, which is about the size of a mini fridge, to track neutrons and neutrinos more effectively and economically. Originally a prototype for a 10-ton version called FINeSSE, SciBath has taken center stage for the project. It's mounted to a cart that has been craned into the MINOS tunnel, 100 meters underground. "SciBath is the first experiment to combine liquid scintillator and wavelength-shifting fibers in an open volume to get tracking precision," said Rex Tayloe, associate professor in neutrino and nuclear physics. "We've put two ideas together into one to get an improved detector to track charged particles." When a neutron created in Fermilab's NuMi neutrino beam reaches the SciBath cube, it hits 70 kilograms of liquid scintillator. If the neutron strikes a charged particle like a proton, the scintillator transforms the energy into light that can be detected by the highly sensitive wavelength-shifting fibers. The fibers, 768 in all, capture blue light emitted from the interaction and shift it to a green wavelength that can be read by the phototubes. Specially designed readout boards record the information. Analysis software will then reconstruct the neutrino track within an innovative 3D grid. "The purpose of SciBath is threefold," said graduate student Lance Garrison. He is one member of the SciBath research team, which also includes postdoc Robert Cooper and graduate students Lori Rebenitsch and Tyler Thornton. For one, the detector will demonstrate 3D reconstructions of neutrino events through a similar process as the neutron interactions. 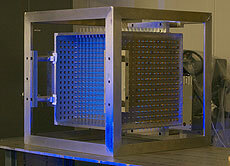 The experiment will also detect background signals from cosmic-induced neutrons, which occur naturally in the universe. The third aspect of the experiment will measure the poorly understood flux caused by fast neutrons emitted from the neutrino beam. The challenge in detecting fast neutrons is that the signal is often overshadowed by existing gamma rays. The neutrons, as they scatter off nuclei, could give insights into background dark matter and double beta decay, the rarest known type of radioactive decay. SciBath has been in the MINOS tunnel for more than a month, and the plans are for it to stay through December, depending on its success. So far, it's performing well. Garrison hopes the detection method will increase the price-to-performance ratio for neutrino detectors, lowering the cost of large-scale detectors while incorporating a higher-precision tracking method. "If everything goes as planned, and we expect it to," Garrison said. "We hope to go underground with an experiment that needs background neutron detection." After proving itself at Fermilab, the team would like to see the SciBath technology used to understand neutron fluxes in low-background experiments like neutrino and dark matter searches and to ultimately be scaled up for a larger role in neutrino detection.